In this month of Thanksgiving, I must say how thankful I am that a year of work will (hopefully) come to successful fruition this coming weekend at the New England Crime Bake for Mystery Readers and Writers. While it has been exciting and stimulating to be co-chair of a conference totally run by mystery-loving volunteers, it also has been challenging and required much effort, as those of you who have been involved in similar ventures well know. It also has eaten up a great deal of writing time and I will be extremely thankful to get that back as of next Monday. Crime Bake, now in its ninth year, takes place in "DEAD"ham, Massachusetts, and is co-sponsored by the New England chapters of Sisters in Crime and Mystery Writers of America. Traditionally the co-chairs are the presidents of these two organizations, which in my case means not only presiding over an active SinC chapter that spans six New England states, it also requires heading a committee of 20 people who hail from three of them -- and with someone I'd met only once before. In addition, this is just my second year on the Crime Bake Committee and it is MWANE President Margaret McLean's first so some of it we've been making up as we go along. The rest comes from a strong cadre of dedicated fellow mystery writers who deeply love this confab, which is known as a writer's conference. Sure, there have been issues, false starts and some mistakes, but I am so grateful for the hard work of each of them because it has been vital to this venture and responsible for us selling out at the beginning of August. 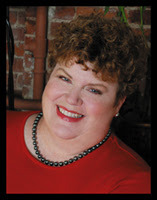 Our guest of honor is the incredible Charlaine Harris (four, count 'em four, mystery series including the Sookie Stackhouse "Southern Vampire" books on which the HBO series True Blood is based). We will be joined by SinC National President Cathy Pickens and national MWA EVP Larry Light. Our lineup includes best-selling New England authors Dennis Lehane (personally invited by yours truly after stalking him at my local chain bookstore), Julia Spencer-Fleming, Hallie Ephron, Sheila Connolly and so many others, as well as exciting debut authors like Barb Ross and Steve Liskow. Our schedule of fascinating panels also features fabulous forensics experts, as well as 10 agents and editors from New York and New England. How can we not succeed? This conference is always stimulating and energizing because the rooms are filled with so many enthusiastic mystery writers dedicated to improving their craft and talking about it. Let's face it: there also aren't many conferences where people can legitimately allow themselves to be excited about discussing murder or ways to dispose of a body. I'm also delighted to note that fellow Working Stiffs bloggers Paula Matter and Ramona DeFelice Long are attending this year, providing an opportunity for us to meet somewhere other than the virtual world and also pose for a photo at the Red & Black Banquet and Vampire Ball that we can share with you later. As Crime Bake approaches, I realize how blessed I am to have found my way to the mystery genre and to now be part of such an amazing community of writers. And I'll be giving thanks for this experience throughout the entire weekend, both when I'm wearing my vampire cape and fangs -- and when I'm not. I can't conclude this without thanking the entire Crime Bake Committee (in alphabetical order): Sybille Barrasso, Jan Brogan, Sheila Connolly, Sharon Daynard, Michele Dorsey, Hallie Ephron, Kate Flora, Janet Halpin, Rosemary Harris, Kathleen Hart, Roberta Isleib, Toni L.P. Kelner, Carol Lynn, Margaret McLean, Paula Munier, Ang Pompano, Ray Salemi, Mo Walsh, and Leslie Wheeler. Pat, I am a Crime Bake rookie, so I am super-duper-excited for the weekend. I don't have fangs or a cape. Maybe I will just carry around my red editor's pen, and try to look menacing. Would one of you please corner Julia Spencer Fleming and find out when her next book will be out. I'm tired of waiting! I'd be there if I could! Meanwhile, I need one or more of you to give the fantabulous Hank Phillippi Ryan a big hug for me if you happen upon her - she's hard to miss, the gorgeous thing! - and I've also got a young friend attending by the name of Kourtney Heintz (unpubbed YA author), so if you see her, make her feel welcome and tell her I said hi. She was down here for Killer Nashville in August, and was a little nervous about the whole conference thing, so be nice to her! Giving thanks to you, Pat and Margaret. I've been continually impressed by how you've both handled the planning, down to the tiniest detail I would have never thought of. Thanks for the shout out and here's to a fantastic event! I'm a rookie too. I can't wait to get there and meet everyone! It is going to be a great event (and I'll tell you a secret -- there will be an abundance of fangs at the the banquet so just wear red and/or black if you don't feel costumey and don't want to compete for one of the fab prizes). I'm sure we'll have some great stories afterward! I wish I could be there. And ditto on Joyce's Julia Spencer-Fleming comment. Looking forward to seeing Pat and Ramona and everyone else this weekend. Last year was my first CrimeBake and they put on a great conference! Jennie, I'll be sure to look for Kourtney!